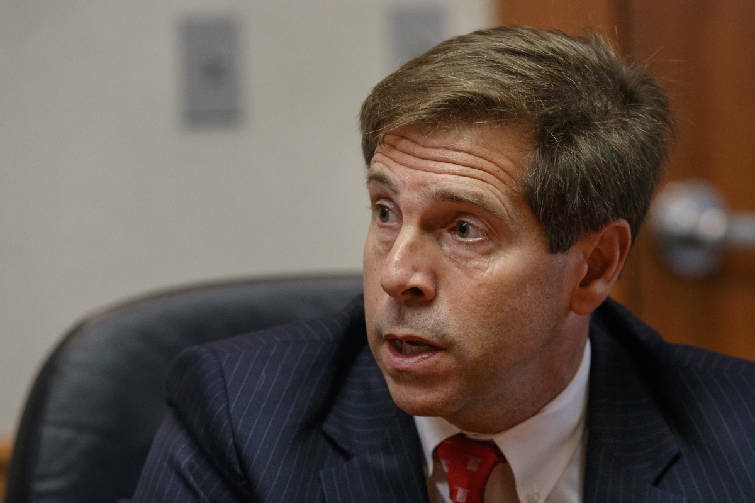 NASHVILLE — Republican U.S. Rep. Chuck Fleischmann had $1.09 million sitting in his bank account March 31 as the Ooltewah Republican seeks a fifth term representing Tennessee's 3rd Congressional District against a field of lesser-known Republicans and one Democrat. By comparison, his only Republican rival in the Aug. 2 GOP primary who had reported as of early Sunday evening, Jeremy Massengale of Cleveland, said his cash on hand at the end of the Jan. 1 through March 31 reporting period was just $396.80. U.S. Rep. Chuck Fleischmann speaks with the Times Free Press editorial board in the newsroom on Tuesday, Aug. 15, 2017, in Chattanooga, Tenn. Meanwhile, Dr. Danielle Mitchell, a Hixson physician and Democrat, reported her cash balance was $69,565 at the end of the first quarter. Candidates' campaign financial disclosures were due to the Federal Election Commission by midnight Sunday. No FEC filings were available for Republicans "Mr. Jim" Elkins of Chattanooga or Harold E. Shevlin of Ooltewah. Republican William E. Spurlock Sr. of Chattanooga only announced earlier this month after the end of the first-quarter reporting period. For the second straight cycle, Fleischmann has avoided a well-known challenger. His first 2010 GOP primary became a ferocious free for all, which he won. The seat strongly leans Republican. Later, he faced challenges in two successive GOP primaries, both of which featured Weston Wamp, the son of former U.S. Rep. Zach Wamp of Chattanooga. During the first quarter, Fleischmann, who serves on the House Appropriations Committee and four of the panel's subcommittees, pulled in another $97,750 in contributions with political action committee donations outnumbering his individual donors by nearly 3-1 or $72,000 to $25,750. But in terms of the overall 2018 election cycle, Fleischmann's individual donors out-gave PACs. Cycle-to-date, Fleischmann reported raking in $483,082 from individuals while $290,875 came from special-interest PACs. His PAC contributions included $1,000 from the National Rifle Association. An executive as well as a PAC associated with Bechtel, which is among companies holding federal contracts with the Y-12 National Security Complex in Oak Ridge, gave as well. Bechtel's national general manager, John Howanitz, contributed $2,700 during the first quarter, bringing his total giving to $5,400 during the 2018 cycle. Bechtel's PAC, meanwhile, contributed $2,500. Oak Ridge is in the 3rd Congressional District and contractors have been a source of political contributions going back at least to then-U.S. Rep. Marilyn Lloyd, a Chattanooga Democrat. Individual donors included James Clayton, owner of Knoxville-based Clayton Homes, a manufactured housing company, who gave $1,500. Closer to home, Baines Global Network executive assistant Tom Jarrell of Ooltewah contributed $2,500 last quarter, bringing his total giving to $5,200. Dave Larson, a one-time U.S. Senate staffer who now heads the American Capitol Group, a lobbying firm, contributed $1,000. Jeffrey Miller, the senior counsel for Leidos Engineering, which does work at Y-12, gave $500. But Fleischmann's largest donor in the first quarter came from a now-lame duck. House Speaker Paul Ryan, through his Prosperity Action leadership PAC, gave the congressman $10,000. By comparison, Democrat Mitchell reported raising $61,425 in the first quarter. After spending $22,337, she had $69,565 in the bank and $8,956 in obligations. Individuals gave $53,916.50 while Mitchell put in another $7,509 herself. She's raised a total of $111,229 during the 2018 cycle, spending $42,664. Mitchell has received support from a number of fellow physicians, including Dr. Frank Knight of Chattanooga, who gave $2,500, and Dr. Martin Redish of Harrison. Retired attorney Deborah Williams of Signal Mountain gave a total of $5,400 with $2,700 for the Democratic primary and another $2,700 for the general election. Long-time Democratic donor Olan Mills II, whose family owned the national portrait studio, gave $2,700 last quarter, bringing his total contributions for both the primary and general to $5,400. Mitchell's largest single expenditure was $5,000 which went to a Washington, D.C., technical consultant who helped set up her campaign management services system. Fleischmann's biggest first quarter expenditure was $8,985 to the Gula Graham Group, which does his fundraising. Another $7,500 went to accountants. Meanwhile, the congressman has picked up a new political consultant, Baker Group Strategies. The firm is headed by Ward Baker, a Tennessean who in the 2016 election cycle served as executive director of the National Republican Senatorial Committee. Baker widely was credited with helping the GOP hold on to its Senate majority. The 3rd District includes the lower counties Hamilton, Polk, McMinn, and Monroe as well as the southern half of Bradley County. Northern counties are Anderson, Roane, Scott, Morgan and Union counties, as well as most of Campbell County. Contact Andy Sher at asher@timesfreepress.com or 615-255-0550. Follow him on Twitter @AndySher1.